Last month Transportation for America’s Chairman John Robert Smith traveled to Overland Park, KS to discuss the economic impact of public transportation dollars on local manufacturing jobs with state and local leaders. Local manufacturer Dimensional Innovations (DI) hosted the event at their facility where attendees saw the recently constructed shelters destined for the Kansas City Streetcar. Transit shelters are one part of the transit supply chain with over 20 percent of DI’s business stemming from public transportation. Catch up with yesterday’s launch webinar for T4America’s new guidebook, Fight for Your Ride: An advocate’s guide for expanding and improving transit, which offers tangible ways to improve transit in your city and region. This story from Seattle, Washington is the seventh in our series of stories illustrating how local communities across the country are casting a vision and often putting their own skin in the game first with local funding while hoping for a strong federal partner to make those plans a reality. Indianapolis took another big step forward this week in their ongoing efforts to expand and improve transit service across the city and region. Monday night, the Indianapolis City-County Council voted to place a measure on this November’s ballot to allow voters to decide whether or not to raise new funding for transit service. Join us on Monday, January 25, 2016 at 3:30pm EST to learn all the details of this new research from the report’s author, as well as what this means for communities considering a BRT line. 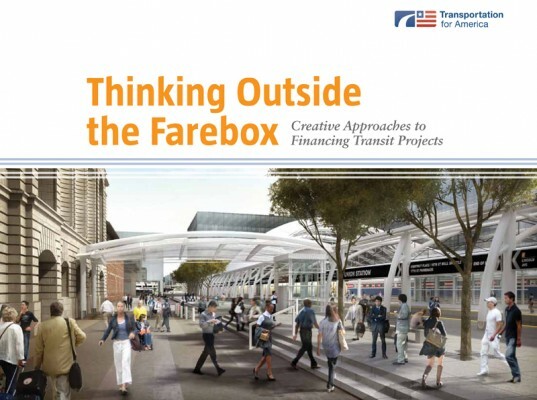 Today T4America unveiled the findings of a new peer-reviewed study that examined existing bus rapid transit (BRT) lines and found strong evidence that BRT systems in the U.S. can indeed generate economic development, attract jobs, retail and affordable housing — at a cost that’s well within reach for many mid-sized American cities. This week, 21 local leaders from three different regions with ambitious plans to invest in public transportation will be traveling to Denver to hear about how that region built an economic development strategy around investing in new public transportation. The demand for public transit is at its highest point in 50 years, and more communities then ever before are looking for funds to build and operate rail and bus lines. Despite the challenges posed by ideological gridlock in Congress, dwindling federal gas tax revenues, and the elimination of earmarks, many communities are finding creative ways to move ahead. Is metro Atlanta vote a bellwether for transportation funding? The Atlanta region soundly rejected a penny sales tax to fund $7.1 billion in new transportation improvements for the traffic-snarled region. Coming on the heels of the passage of MAP-21, a federal bill indicating a shrinking federal role in transportation funding, many wondered: Will metro regions and localities be able to bootstrap their way out of congestion and mobility woes? Was the failure of Atlanta’s transportation vote a bellwether for votes in other states and metros? 15 events around the country today highlight the devastating impact of the House’s initial transportation proposal that would make a 35 percent cut to public transportation. Today is the “Don’t X Out Public Transportation” day of action to highlight the crippling impacts of the proposed 35 percent cut to public transit. The events are being held in 15 cities in cooperation with the American Public Transportation Association and a number of key partners to let Congress know that deep cuts mean Americans losing their jobs or their ability to get to their jobs, as well as groceries and essential services.